Hello friends! We have had such a gorgeous weekend here in Middle Tennessee! I hope you did as well. Saturday morning was a little cool but by Sunday afternoon it was in the 70's and absolutely gorgeous! My hubby is off work until the Wednesday after Easter and I have to admit that with this gorgeous weather, I'm pretty envious! It was back to work for me on Monday. 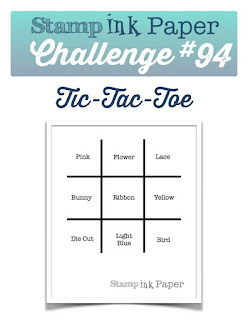 Well since it is Tuesday, that means another Stamp, Ink, Paper Challenge and this time we have a fun Tic-Tac-Toe Challenge! I had just a couple of other Easter Cards to finish up so this one worked with that need perfectly! Are you tired of My Lawn Fawn Rainbow Perfectly Plaid yet? I just adore this paper so I had to get another use out of it. lol Also this adorable Hero Arts March 2017 My Monthly Hero kit with the Bunnies.. they are just too stinkin' cute! I started with an 11" x 4 1/4" piece of 110# Neenah Crest Solar White that was scored at 5 1/2. I used Avery Elle Wonky Stitches Dies to cut my Lawn Fawn Rainbow Perfectly Plaid panel. The smaller panel was 80# Neenah Crest Solar White cardstock that had Tim Holtz Broken China Distress Ink blended onto it with a Ink Blending Tool. I added more of the Rainbow Plaid in green that was cut with the Lawn Fawn Grassy Border Die Cut onto the bottom of the ink blended layer. Once the grassy border was attached to the ink blended panel, I cut it out with a smaller of the Avery Elle Wonky Stitches Dies. 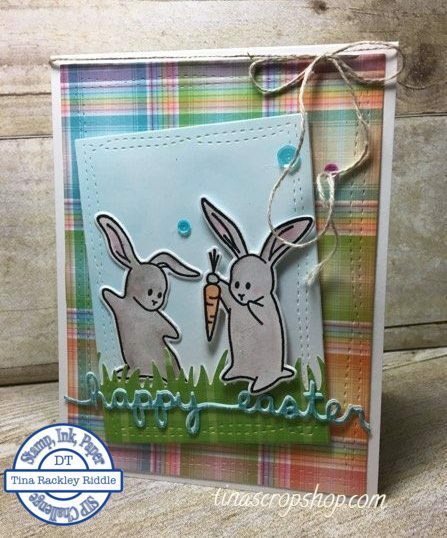 My bunnies from the Hero Arts March 2017 My Month Hero Kit were stamped onto Bristol Smooth Cardstock with Versafine Ink and heat set. I used Zig Clean Color Markers to color in my bunnies. The one on the left is glued directly onto the card panel and the bunny on the right is attached with foam tape. I cut happy easter with the Lawn Fawn "easter border" die out of white cardstock and then a piece of the Rainbow blue plaid. I layered them just a little offset so that the white would peek through to add some dimension. The words were then attached with a Fine Tip Glue Pen. Lastly I added three Pretty Pink Posh sequins with more of the Fine Tip Glue Pen to finish it off. I think it turned out super cute.